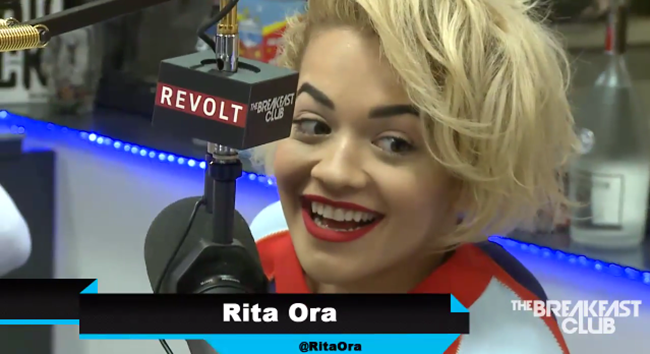 It's Just Mobolaji | Music & Entertainment: Rita Ora Stops by The Breakfast Club! Talks Music, Acting, Rihanna, Dating, and Worth $145M? Rita Ora Stops by The Breakfast Club! Talks Music, Acting, Rihanna, Dating, and Worth $145M? Watching Rita Ora on The Breakfast Club we just get to see how cool and down to earth she really is. A few of us were iffy on if we really liked her or not, but after this interview - a lot of people are bound to become a fan of her personality and bubbly spirit. In this interview with The Breakfast Club, Ms Ora didn't hold back at all in this 20 minute interview. She spoke to DJ Envy, Angela Yee and Charlamagne the God about her music, and why she didn't release an album in the states - also about her forthcoming album. The cast of The Breakfast Club did not shy away from asking Rita about her ex - Rob Kardashian, who she gladly spoke about without hesitation, and also talking about the "20 men" she allegedly slept with, after Rob took to his twitter page to rant (like a b-tch boy). She showed how loved up she is - by talking about her new relationship with producer Calvin Harris. Charlamagne even went onto asking Rita about her net worth, who is apparently worth $145 million. Which Rita Ora did not deny, she owns a clothing line, a football team in Kosovo, a deal with Adidas, her album sales in the UK and overseas; and so much more to mention a few. Often compared to Rihanna, Rita Ora cleared up rumours of having beef with her fellow label mate and even went on to say how they've both got their own thing going on. Speaking on meeting Jay-Z and the dating rumours - once again Rita Ora cleared those right up stating she'd never disrespect Beyoncé and that it's totally out of the question if she'd ever do that. This interview was definitely a better insight to who Ms Ora truly is, makes you wanna like her music more. Watch below as she talks about all things mentioned above, and also why she dropped out of school and left home at the age of 15 and finding her music in the hands of Jay-Z. Also, on her role as Maya Grey in the novel turned movie '50 Shades of Grey'. Juicy stuff!